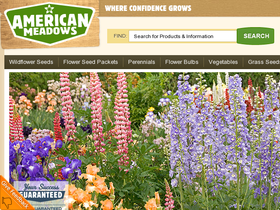 American Meadows, online at americanmeadows.com, offers the best things to grow in your garden. American Meadows offers wildflowers seeds, flower bulbs, flower seed packets, vegetable seeds, and perennial plants and flowers. American Meadows also carries a great selection of grass seeds, gardening tools and gifts. American Meadows offers varieties of plants for all zones, seasons, growing conditions, and uses. So enjoy a bountiful garden with American Meadows. But before you shop, get all the latest americanmeadows.com discounts, American Meadows promotions, and American Meadows coupon codes found here at RetailSteal.com. American Meadow ships within the continental United States, and offers select shipping to Canada, Alaska and Hawaii. See site for more information. Save $5 on orders of $40 or more at American Meadows when you enter this code at checkout today. Act now and enjoy free shipping on all seed packets from American Meadows online. Shop online at AmericanMeadows.com today and save up to 50% off a wide variety of perennials. Save 25% on regional wildflower mixes on sale at American Meadows. Click link to shop and save. Save up to 35% on berries and grapes on sale now at American Meadows. Click here to save. Sign up for newsletters from AmericanMeadows.com and they'll send you a coupon code for $5 off you next order. Shop for vegetable seed packets, starting from $1.49 from American Meadows. Click here to shop and save.